Over at Crazy Hip Blog Mama's, this week's carnival is all about your dream job. Of course motherhood rocks, but c'mon you know there are times that you sit and dream of that one job that would make life perfect. For me, my dream job has always been wanting to be a professional party planner and own my own party planning company. I remember when I was little somebody telling me that the president had his very own party planner and thinking...that is the job I want!! Unfortunately I didn't make it to the White House, but I did plan my own wedding, a few parties for friends and family, and I can throw a wicked little kid birthday party!! Give me a theme and I am off...invites, decorations, food, crafts, games...it thrills me to be able to organize and see it all come together. Most importantly I enjoy seeing the end result as people gather around and the good times roll. I am so envious of Jennifer Lopez as the Wedding Planner...I would give anything to be her (in that job, not in her real life). Oh well, people do have to get second careers now-a-days so maybe when I retire from teaching I can pursue this dream. Meanwhile if you live in Delaware and want a birthday party planned for your little one that will never be forgotten email me so I can at least pretend for now! 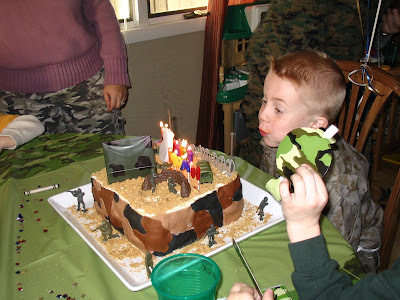 Dyl turned 6 and wanted a "marine" party in honor of his Uncle Dan. My dad helped with the cake...it was the highlight of the party. You can see we all got into our cami's to enjoy the festivities. So now that you know my dream job come join in the fun...head on over to sign Mr. Linky at Crazy Hip Blog Mama and don't forget to leave me a comment so I can come read about your dream job! I don't know if the comment goes on the top of the post or the bottom... I'm here via Stephanie at the bloggers who are so incredibly brave to put their natural face on the screen. I participated - I'm glad you did too!! That's a darling little angel on your side btw. 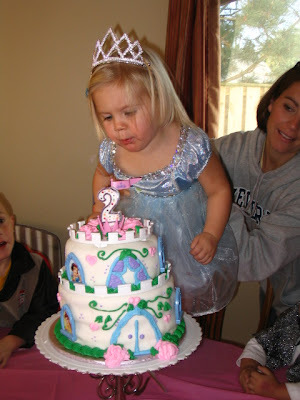 Look at that princess cake! How cool! 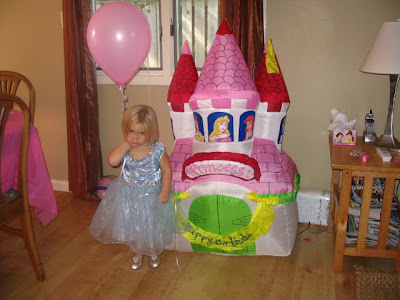 I was just commenting to my co-worker that I want d to have a princess party for her first birthday. You would make a great party planner!